Tuesday 27th February, 8.30pm @ Arena Project Space, 2 Kerr St Fitzroy. $7 entry. Special screening of films of one of the contemporary masters of hand-made cinema Esther Urlus. Urlus is the driving force behind the Rotterdam artist-run film lab Filmverkplaats. Her films regularly tour the experimental film circuit and usually premier at Rotterdam IFF. Come see what is going on now in the international film labs scene. All screening on 16mm. Prints generously made available by the artist. My first film. Made at the former Studio Een super8 filmlab in Rotterdam.A super8 camera is used in time-lapse mode to spy on my pets. What do they do when I’m not at home. Hand developed the next day, projected and….. Behold here, the secret life of ferrets. The film is showing a series of empty interiors of houses a few days befor their demolition due to urban renewal. An attack of imagined nostalgia for childhood. The applied do-it-yourself bas-relief print technique ensures a coloured image. Dense, addictive, multi-pass, colour printing with trees shorn of their leaves transformed into thirty six layer deep technicolour. Deep Red is an investigation into additive colour mixing on film. Handmade by a d-i-y silkscreen printing technique. Starting point are on black and white hi-con filmed trees shorn of their leaves. As if they're the reminiscent of branches seen flashing past in the night from the back seat of a car. Transformed into thirty six layer deep technicolour. A research into motion picture printing techniques. Starting point and inspiration for the film are the mill paintings of Piet Mondriaan, especially Rode Molen. 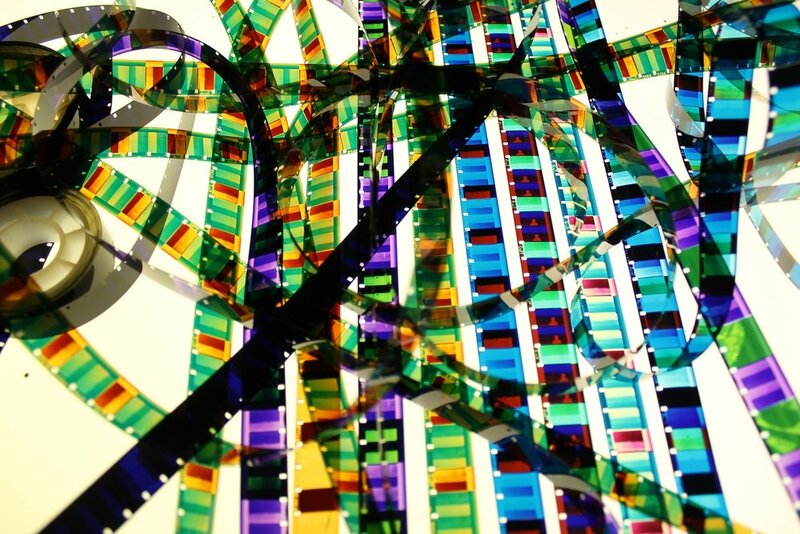 In the film color is created by multiple exposures through different masks during printing. Depending what developing process is used the colors mix in two ways: additive or subtractive. A fictional re-enactment of a 5 minutes happening that took place during the Olympic games in Berlin 1936 and Lieutenant Konrad and his horse Kurfurst became famous for their appearance. The film is made on homebrew emulsion and color toned with the helping hand of technical publications from early cinema and photographic experiments. The home brew emulsion as fragile metaphor for the heroism of Konrad and his horse Kurfurst. Falling from his horse he became a national hero but overtaken by history, an anti-hero. Elli employs a flicker effect to evoke an oppressive feeling, in contrast to the exhibited calmness of the sea. This technique of manipulating the standard 24-images per second experience of motion picture film can cause physical reactions, and the viewer will sense seeing colours and shapes emerging from the image, in this case the shape of a frigate (an Elli Cruiser), laying motionless at anchor in a bay, seeming to appear as an afterimage in the coloured, flickering sequences. The sound you hear is caused by the optical noise of film grain. Mastered through a written piece of code which chooses the sample size of the image and is triggered by luma (light levels) and the separate colour values for RG and B. An explosion of colour, yet without any clear, identifiable images. Still, the spectator, almost unconsciously, notices that something distressing is going on. Something that makes you shudder and awakens a deep, dark part in your primordial instinct. In our view on the world we continuously filter, block and distort certain parts. We commit ourselves to a perception that does not necessarily correspond with reality. Maybe not being able to identify what we see is essential to provoke our imagination. Will you look differently at the image knowing that it represents something horrible? Deletion is inspired on the abandoned process of creating colour, Autochrome, and is made with homebrew film emulsion.